At Carrington Financial Services, LLC we pride ourselves with using all of the most up to date equipment, computer software and programs, and technology. We have secured technical capacity and can work remotely with any of our clients. Located at 419 Whalley Avenue, Suite 301, 3rd Floor in New Haven, Connecticut, our hours of operations are Monday thru Friday from 9 a.m. to 5 p.m. with Saturday hours by appointment only. Our office suites are handicap accessible. We have been serving individuals and small businesses in the Greater New Haven and Bridgeport areas since 1992. We pride ourselves with working diligently to minimize your tax liability and to maximize your cash flow with accuracy and efficiently. Clients walk away with the tools, strategies, and ideas they need to enhance their business. We are not a seasonal company and are available for our tax clients all year round. Also a training site for accounting and business college students, we happily work closely with current and recent graduates from the local universities and community colleges. We also provide pro bono training and business consulting services to new businesses. Carrington Financial Services, LLC is a member of the Greater New Haven Business and Professional Association and the Greater New Haven Chamber of Commerce. 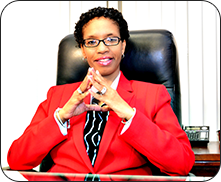 Larcina Carrington Wynn is the President and founder of Carrington Financial Services, LLC. For more than 20 years, Mrs. Wynn has provided accounting and financial services to the New Haven, Connecticut community. Serving as director for not- for- profits in the New Haven area as well as business manager for a local community health clinic, Mrs. Wynn managed million dollar budgets, grants, and contracts. After earning her Bachelor of Science in Financial Accounting from the University of New Haven in 1985, she was trained as a registered tax preparer by H&R Block. She is currently pursuing certification as an Internal Revenue Service Enrolled Agent and is seeking an Accreditation as a Tax Preparer and Tax Advisor. As a lifelong resident of the city of New Haven, Ms Wynn takes pride in the work that she does within her community. Mrs. Wynn served on various boards within her community.